A while after I watched those youngsters fighting, I had an argument of my own to sort out. 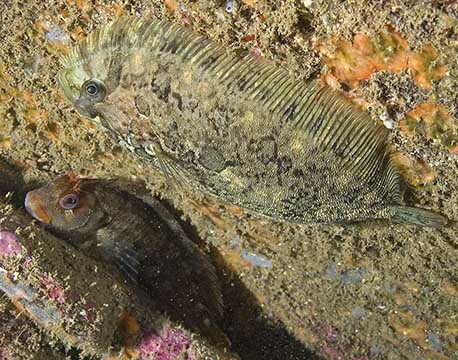 Another large male tompot blenny (that’s him on the right in the video) was spending too much time near my home, so I swam out to confront him. Our stand-off lasted nearly 30 minutes and the video below shows just a small part of it. You can see we were both trying to scare each other away and prove we were the bravest, without actually using our teeth and risking getting a nasty injury. We’re a bit older and wiser than those youngsters! You could say we were ‘all show and no go’ but a lot of adult animals use that tactic, not just fish like me. Anyway, you’ll be pleased to know I saw the intruder off in the end and am still the proud boss of my crevice!